Boerboel UK are committed to ensuring that our beloved Boerboels receive the love and care they deserve. From time to time our breeders rehome an older dog looking for a retirement home & loving family to take care of them. Our breeders have also been known to foster dogs who are looking for a new forever home. This page will contain details of any dogs we are helping to rehome or rescue. 14 Apr2017 - Buster may now be sorted. Thank you to everyone who got in touch. Thank you you for looking and check back soon as we regularly get contacted about dogs in need. If you have a Boerboel that needs rehoming please feel free to contact us and we will help where we can. ​Please note we can only help rehome dogs in the UK. 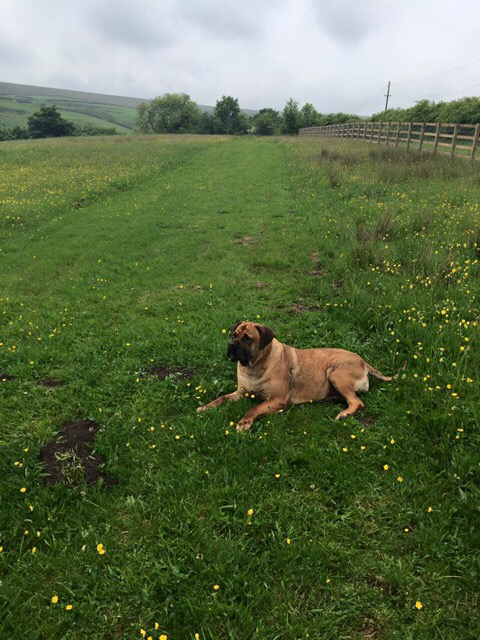 Boerboel UK have not assessed any dog up for re homing unless specifically stated. The descriptions of the dogs are provided by the current owners or people re homing the dog. 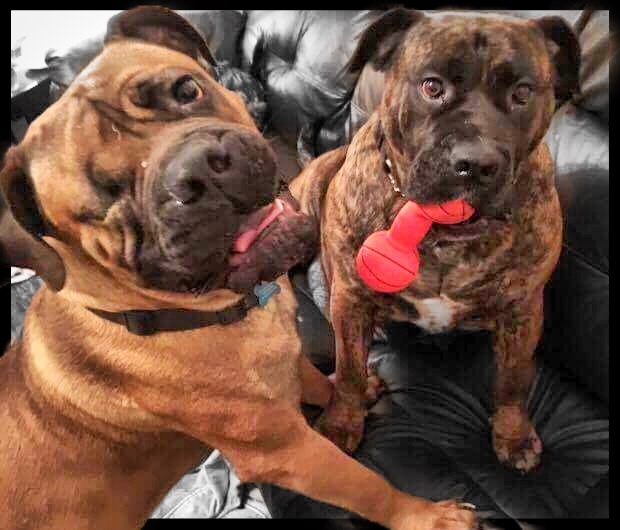 Boerboel UK make not assurances that the information provided is correct and we recommend that anyone interested in re homing a dog make their own assessment of the animal. George now has a new home. Thank you to everyone that made contact about George. George is a 2.5 year old male who was rescued from a shelter in Berkshire. George came to us underweight and quite depressed. He has since received a lot of love, training, good nutrition and socialisation. He is now up to a healthy 60Kg (from 43Kg). He is a very people friendly dog and craves human contact, loves chest rubs and attention/affection. As a young male he can get excited but we have worked hard to keep his behaviour calm and relaxed and he understands boundaries better now and doesn't jump up anywhere near as when we first brought him home. He is excellent with our 2 year old daughter (see pictured). Initially George was also very good with our 2 other dogs however after 6 weeks he started showing signs of dominance towards our female GSD, which gradually escalated so now we have to keep them apart as they will (and have) engaged in some full-on fights. This is the reason why we are looking to re-home him. It should be noted that he is good with our younger male mastiff and generally aloof with other dogs. However like many male Boerboels he won's back down if challenged by a dominant male. He would suit a family familiar with the breed. 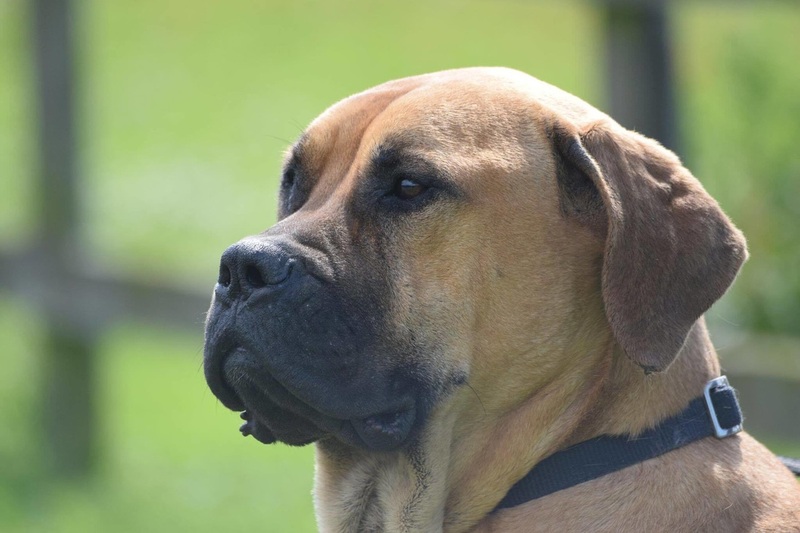 He is a very impressive looking Boerboel but perhaps a little on the short side. He is sensitive and I've found him to be very responsive to training. He walks excellently on a loose lead. Sits at every kerb. Waits until allowed (given the go-ahead) to eat his meals and understands "No", "Off" and "Leave" to which he responds immediately. He likes nothing more than to curl up at your feet in the evening and/or rest his head in your lap and in many ways he's our ideal dog. It is a real shame he and our GSD can't get along. We've had 2 good behaviourists come in and assess the situation both have said management is our best option as when we've tried to re-establish Ash and George neither would snap out of fight mode even when separated at considerable distance (the stare down would not break + baring of teeth from the GSD etc). We would be happy to provide a crate with him (and full hand-over pack). He is fully crate trained and goes in there on command and each night. He is a quiet dog and doesn’t bark much, if at all. He didn't like crates at first and broke out of a few of them but is now happy to go in on command. He is fully house trained and in excellent health. He has been castrated, wormed and de-flead. We are in no rush to re-home him and it is very important to us that he goes to a dedicated, loving new owner, ideally one who has owned a Boerboel (or similar) in the past. It's a tough decision for us but it is the right one for George as in a suitable single dog household he will have more time with people and therefore a better quality of life. If anyone has any questions I'd be happy to answer them. We'd like any potential owner to provide assurances that they have all the time/resources required to offer George the right environment and lifestyle. We've had to turn down a couple of people who liked the look of him but didn't really understand the "complete package", additionally they admitted that they wouldn't be at home much due to work commitments - so he would probably be worse off than he is now. ​By the edge of a woods, at the foot of a hill,Is a lush, green meadow where time stands still. Aggi is a impressive dog who was a beloved member of the Sandaharr family. 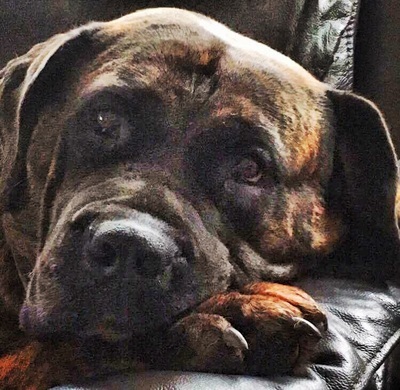 After producing some fantastic litters Sandra at Sandaharr Boerboels decided that she would look for a loving family that would adore Aggi as much as she did and take care of her during her well deserved retirement. Aggi stole the hearts of everyone that met her including Gail and Gary. Gail and Gary fell for Aggi and decided to make her a part of their family. "We've always had pups, I guess you always think raise them yourself and hopefully they will turn out how you want them to be. I remember being on the BUKS page and I saw this amazing face of a brindle mature BB girl and I pressed the like button and wrote "she's beautiful" I showed the pic to my hubby and i said "I would love her" I didn't know my hubby knew she was looking for her forever home.. We had already got a BB pup Rogue who was 7 months old and if I'm honest he needed a companion but still I hadn't given it any thought of another dog. Sandra messaged me and said Aggi was looking for a forever home. I looked at Gaz and said "OMG Aggi needs a forever home, what do you think?" We chatted about having a mature dog deliberated on the questions, will she get on with our other pets? Will she be sociable? How is she with children? as our youngest was only 10. I messaged Sandra and asked every question that needed to be asked and she assured us that with us having Rogue, two little Chorkies she would just "slot" in. Sandra said she was great with children and around people and gives the biggest hugs. We decided let's give this gorgeous girl the retirement she deserves. So up to Scotland we went and we met Sandra, Harry, Aggs and the rest of the gang. Taking Aggs was bittersweet for Sandra, she loved her so much but knew she would retire in comfort and have more one on one time. For me that was such a selfless act as the tears flowed when we took her. Getting her home and introducing her to everyone was flawless. Aggs did exactly what Sandra said she would, she's become an amazing role model/mother/companion for Rogue and the little ones. She's so tolerant of our boy when he's pushing boundaries and playing up. She is the biggest lap dog you will ever meet and the hugs and love she gives not just to us but everyone she meets is amazing. I look at her and I know in my heart it's the best decision we've made in having another dog. She's one of the best we've had and if I'm honest she's the best behaved too. We couldn't ask for anything more than she is. I look at her and my heart just melts. If we were ever to decide on another BB I would def be having one that needs a loving home. I need Aggs as much as she needs me, I can't imagine being without her x"
After seeing Chloe advertised on Boerboel UK Facebook Page and on this website a very kind man called John has adopted Chloe and given her a great family home. 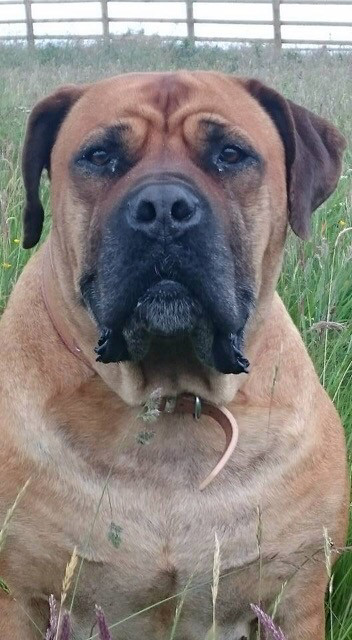 Take a look on the Boerboel UK Facebook page to see Johns updates and pictures about how Chloe is settling in. Chloe is approximately 4 years old, she came into rescue earlier in the year with her family including her mate and her 2 young daughters, they had lived together with a large family including children and other animals. Whilst in rescue Chloe became a firm favourite with all the staff and volunteers. Her family have all been successfully re homed and settled but Chloe is still waiting for her forever home. She was adopted in July and went to live with a lady who loved her dearly and whom Chloe was very attached to. 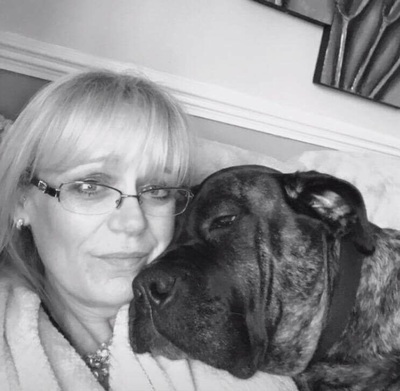 Unfortunately as Boerboel’s are renowned for their strong desire to protect their family Chloe became too much to handle for this lady when they were out walking, heartbroken the lady tried to keep going but Chloe can be very strong. She returned to the rescue looking fantastic having lost weight and has a lot more energy its just such a shame that this didn’t work out. She has a lovely, gentle nature and she loves lots of cuddles but she is protective of her owner and has displayed occasional aggression towards some dogs and people whilst out walking, there is no pattern to this but she really needs someone who is familiar with the breed and can control her behaviour appropriately. Chloe does suffer with an allergy, we think this is hay fever and effects her eyes so drops are applied, she also may have some rheumatism but she’s not on medication and since she has shed some of her weight this seems to have improved her mobility.